This year I want to complement my Mandarin University studies with more self-study. One of the things I’ve stumbled upon is Anki. It’s a flashcard program that uses SRS. 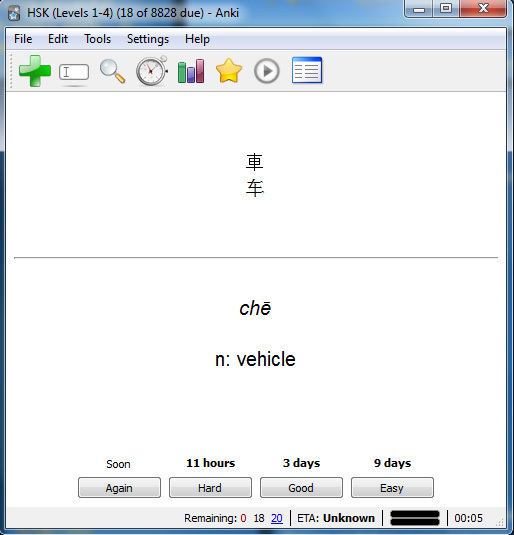 I quote the description: “Anki is a spaced repetition system (SRS). It helps you remember things by intelligently scheduling flashcards, so that you can learn a lot of information with a minimum amount of effort”. It’s a pretty nifty program. I use it now every day. You can download decks from inside the program. I downloaded two HSK decks and I’m doing them both. I might have to speed things up if I want to improve my Mandarin otherwise this HSK one above, which has 8828 cards will take some time if I review 20 cards a day and that’s not counting the ones that reoccur due to SRS. I’ll keep you guys updated on the progress.